The following is a response to an article trying to enlist the poet Homer on the side of hawks by the Boston Globe’s resident neocon right winger Jeff Jacoby. This letter was not published. The bloody dissolution of the sit-ins in Al-Nahda Square and Raba'a al-Adawiyya is nothing but a massacre—prepared in advance. It aims to liquidate the Muslim Brotherhood. But, it is also part of a plan to liquidate the Egyptian Revolution and restore the military-police state of the Mubarak regime. The Victims of "Welfare Reform"
The following letter from me was published in the Boston Globe on June 26, 2013. The ghost of Reagan’s welfare queen still hovers over conservatives. She is black. She is a large part of Mitt Romney’s 47 percent of moochers, and the “takers” that conservatives talk so much about. Most people don’t talk about welfare or know much about it, but conservatives, who also don’t know much about it, use it as a threat when they seek reelection or talk about policy. Republicans, and some Democrats, declare that welfare reform was a success because it brought the rolls down and put “free loaders” back to work. Our correspondent and contributor in South Africa, Andre Marais, sent us the link to this recording of the Rosa Choir, a diverse group that sings in traditional songs in Afrikaans, Xhosa and English. The following open letter was issued yesterday. We have read about your strike against threatened pay cuts and the Greek government’s emergency decree and use of riot police to force you back to work. We are horrified by the attempt to toss your contracts aside; your pay is already not adequate to maintain a decent standard of living. In a surprisingly warm and positive obituary, the New York Times noted the death of Michael Wreszin in August of this year. 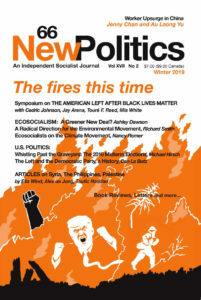 The obit says of Wrezin’s writings, “His subjects were cosmopolitan, humanist thinkers who saw a growing militarism in American political culture but whose scrupulous habits of mind could make them misfits in the ideological camps they joined.” Mike Wreszin was a frequent contributor to New Politics. We miss him already. I have read many analyses of the failure to recall Gov. Walker in Wisconsin, and I am astonished that not one even mentions American industries either outsourcing or just folding their tents because they are unable to compete with foreign companies. Steel is an example of the latter: many steel workers now work as greeters at Walmart. Surely this is an important cause of labor’s sad decline. Industrial capitalism has given way to finance capitalism, as everyone knows. It has become fashionable, especially among conservatives, to portray public employees as lazy and inefficient, as compared to private sector workers who are touted as hard working, efficient, and cost effective. In this invective, all public sector workers are lumped together— teachers, police, firemen, welfare workers, Social Security workers, etc. The Massachusetts legislature has decided that the poor can’t be trusted with money, and a legislative commission has considered not allowing recipients of food stamps (now called SNAP, Supplemental Nutrition Assistance Program) and recipients of welfare (TAFDC) to use cash for any of their purchases (such as paying the rent), and issuing vouchers instead. The Massachusetts legislature has established an Electronic Benefit Transfer (EBT) Commission, which is now holding hearings on how people use their EBT (food stamp, aka SNAP) cards. They heard that a Massachusetts resident had used an EBT card in Hawaii. They concluded that there must be some fraud involved, which they should investigate and put a stop to. In fact, food stamps are national, administered by the United States Department of Agriculture, and can be used in any state. Government officials tell us how many people are living at or below the poverty line, but they don’t tell us how low the poverty line is. A more appropriate name would be the “near starvation line.” The federal poverty line is based on a formula arrived at in 1963, which set the poverty line at three times the annual cost of food under a “low-cost budget,” without considering housing, fuel costs, or child care costs, all of which have escalated substantially in the past forty-nine years. New York magazine published an article called “2012=1968?” Author John Heilemann implies that Occupy Wall Street should forge the “working alliance between Democrats and the movement” that Todd Gitlin hopes for. But in my view this alliance would be a suicidal disaster; it would rob the movement of its potential to spark real change. MEANS-TESTING SOCIAL SECURITY is a proposal that some policy-makers are considering. That would be the beginning of the end for the program. When Social Security was first begun, in 1935 during the administration of Franklin D. Roosevelt, some people proposed means-testing it as they means-tested Aid to Dependent Children (now TANF, Temporary Assistance to Needy Families). Roosevelt resisted it, knowing that would make it politically vulnerable. In order to protect it, Social Security needed to be universal. The rich as well as the poor would receive it. The Campaign for Peace and Democracy issued two statements on June 9, one on the movement for democracy in Syria and the other on Israel’s brutal response to unarmed demonstrators.